Started by Caligula (AD 12 - 41) and officially finished by Claudius (10 BC - AD 54), the Aqua Claudia was constructed between 38 and 52 AD. 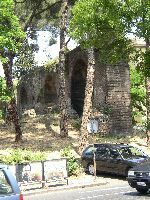 The date of completion is given in an inscription at Porta Maggiore, but Tacitus (2.13) suggest that the aqueduct was in use by 47 AD. 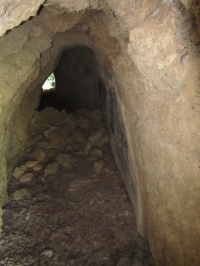 It was fairly common practice to begin using an aqueduct before construction was completed. 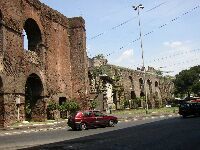 Caligula ordered its construction because the seven existing aqueducts were by now inadequate due to the demand for water from consumption and utilities such as the baths. 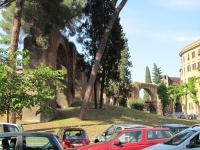 It is on account of its massive arches that the Claudia is one of Rome's most visually impressive aqueducts. 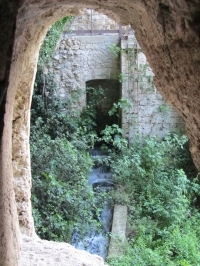 Its source is a number of springs in the Anio Valley, near Agosta and close to the sources of the Marcia. Originally there were two springs, the Caeruleus and Curtius. Later these were to be supplemented by the Albudinus spring. From its source the Claudia descended along the right bank of the Anio, mostly underground and slightly uphill from the Marcia. 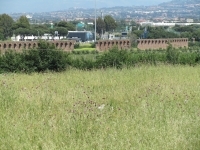 Originally the Claudia crossed to the left bank of the Anio over a bridge below Vicovaro. 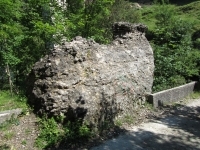 Remains of this bridge have been incorporated in a modern road bridge. 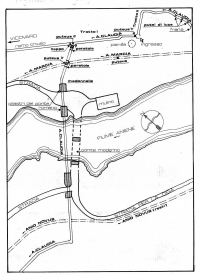 Hadrian built an alternate loop that crossed the Anio upstream at the gorge of S. Cosimato near the base of the hydroelectric dam. 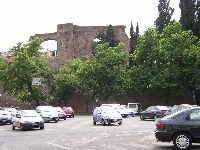 On the left bank of the Anio the Claudia followed approximately the same route as that of the Marcia and Anio Vetus, even crossing their paths occasionally on its way around Tivoli towards the Alban Hills. Like the Marcia, he Claudia emerged above ground near Capannelle and crossed the land near Romavecchia on a long series of high arches. 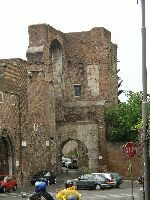 After about ten kilometres on arches, the Claudia entered Rome at Spes Vetus and crossed the Via Prenestina and Labicana on Porta Maggiore. 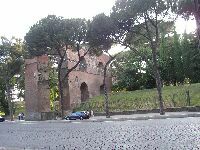 Its 'castellum' was on the Esquiline Hill, near the temple to Minerva Medici. )1 Nothing remains of this once imposing 'castellum', which was destroyed by fire in 1880 when it was being used as a hay barn (Aicher, 1995:55). Piranesi's etching (see D.27) is useful when imagining what the 21.5 by 14.2 metres and several stories high 'castellum' looked like. Porta Maggiore can be seen in the background of this etching. 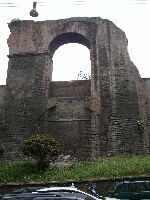 Inscriptions on the Porta Praenestina indicate that Vespasian (AD 9 - 79) and Titus (AD 39 - 81) )2 repaired the aqueduct shortly after its completion, in 71 AD, after a nine year period of inoperation. Furthermore, Hadrian (AD 76 - 138) and the Severans carried out later restorations. Brick stamps from 123 AD provide the evidence for Hadrian's restoration, which had an elegance about them which was unusual in this type of undertaking. Restorations during the latter, less prosperous period were more utilitarian in nature. 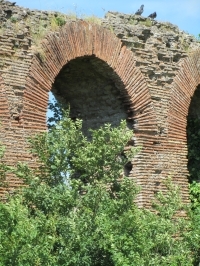 After Nero (AD 37 - 68) built the Arcus Neroniani, one of the Claudia's branch lines, and because of its height, the aqueduct could supply water to all fourteen districts. 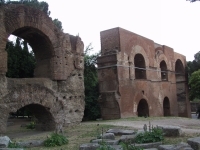 Domitian (AD 51 - 96) also added a branch to supply water to the imperial palaces on the Palatine Hill. It was one of the more difficult aqueducts to maintain, possibly because of its innovations. The Claudia was 69 km long and delivered 185,000 m3 per day. While the measurements for the water volume at their intakes are close for the Claudia and Marcia, Frontinus describes the Claudia as 'abundantior aliis'. He also states that the channel could not receive all the water available at the intake. The nine year hiatus in operation is a puzzling aspect, especially when it is realised that the Claudia accounted for nearly 20% of Rome's water supply at that time. It is exceedingly strange that the aqueduct should break only 15 years after entering operation, and only 8 years after its official opening, unless it was poorly constructed or suffered a series of unfortunate disasters, or both. The relatively low cost of the Claudia points to lower quality building materials or hurried construction. However, while low quality material and construction might explain why the Claudia collapsed, it does not explain why it took so long to repair it. Some major events of the 60s serve to provide clues for this. 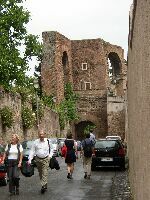 Firstly, a there was major earthquake in southern Italy 5 February 62 AD, which caused extensive damage to a number of towns, including Pompeii. Though there is little to no evidence suggesting that the earthquake effected Rome, the date coincides with the breakdown of the Claudia. In the same year a storm wrecks 200 ships in the newly constructed but still incomplete Claudian harbour at Ostia, and a 100 more by accidental fire further upstream (Tac., Ann. 15.18). The storm may have been a tsunami caused by the same earthquake that damaged Pompeii. If this is the case, it points to a powerful earthquake that might have caused some damage to Rome. One result of the storm was the loss of huge quantities of corn at the harbour, in warehouses and on the ships. The destruction of so much corn, when Nero has just thrown away vast quantities of old spoilt corn, must have led to shortages. These particular events may not have damaged the aqueduct itself, but may have further drained the imperial coffers. Nero was well-known for his financial irresponsibility (Cary & Scullard, 1975:361). 'It began in the circus, where it adjoins the Palatine and Caelian Hills... the conflagration instantly grew and swept the whole length of the circus... the fire swept over the level spaces and then climbed the hills, but returned to ravage the lower ground again.... 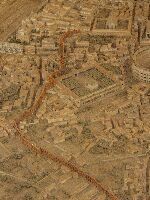 When [the residents of Rome] escaped to neighbouring quarters, the fire followed even into districts believed too remote to be involved... the flames overwhelmed the whole of the Palatine... [the fire] was finally stamped out at the foot of the Esquiline Hill'. However, flames broke out again and many temples and 'pleasure arcades' were destroyed. )3 It is possible that the Claudia was damaged by the fire, as it would have passed through some of the worse effected regions. 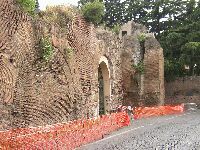 However, as the Claudia and Anio Novus met in Rome and there is no mention of the Anio Novus being damaged, the damage that caused the shutdown of the Claudia is unlikely to be the fire. Instead, the fire may have reduced the combined Claudia/Anio Novus line to the extent that it would be unwarranted to repair the Claudia until the damage within Rome had been repaired. This is indeed quite plausible. Also, this expenditure and diversion of resources may have further delayed the repairs of the Claudia. The fire may have had another effect. Subsequent to the fire massive rebuilding took place in the area where the Colosseum would later be built. Nero began to build his Domus Aurea, or Golden Palace, which consisted of a 120 foot statue of Nero, parks, colonnades and, most significantly, a large lake. The most convenient aqueduct to use to fill and maintain the lakes would have been the Claudia. It is possible that Nero drained the Claudia for this purpose. 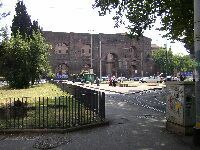 Sometime between 70 and 72 AD Vespasian began construction of the Flavian Amphitheatre, later known as the Colloseum. It would have been necessary to drain Nero's lakes to build the amphitheatre, at which time the water from the Claudia would no longer be needed. The timing of these two events is suggestive of a link. A somewhat prosaic explanation may be that, during the construction of the Arcus Neroniani, the Claudia was shut off. This is unlikely, as it would have not been necessary to cut of the supply for more than a week, if it was cut off at not just diverted, which was the common practice. Finally, there was the political unrest which culminated in 69. Nero toured Greece from 67-68. His imperious showmanship not only caused him to neglect urgent public business, but involved him in riotous expenditure which threw the state finances into grave embarrassment (Cary & Scullard, 1975:359). Taken in isolation these events suggest little, but in concert may have resulted in delayed repairs for the Claudia. 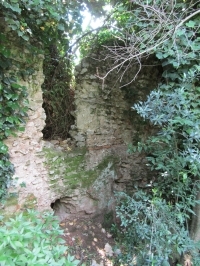 The remains of the Claudia show repeated efforts at repair from its construction and throughout the second and third centuries (Richardson, 1992:16). It is entirely possible that the Claudia was badly built and suffered from poor workmanship. 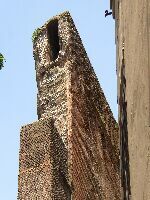 Despite Vitruvius, many Roman buildings did not exhibit 'firmitatis'. Disasters due to poor workmanship were not unknown. Suetonius tells us of the panic in the Theatre of Marcellus shortly after its completion under Augustus, brought on by the crowd's fear of the structural integrity of the building. At the collapse of the amphitheatre at Fidenae, which killed perhaps as many as twenty thousand people, which was considered a grievous calamity, Tiberius returned from his island retreat of Capri (Taylor, 2007:5), an unusual act. The interruption has also been doubted by a number of authors (Richardson, 1992:16 and Evans, 1983:393). One of the reasons given is that Vespasian claimed to have repaired the Claudia for propaganda reasons. In all probability, low quality construction, fire and alternate uses for the water explain why the Claudia was out of operation for such a long period of time. 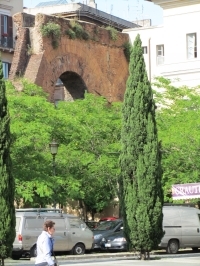 The 'Arcus Caelimontani' furnishes new insights into Nero's sometimes overlooked accomplishments as an urban planner, while they also prompt us to reassess the true achievement of the Claudian aqueducts. 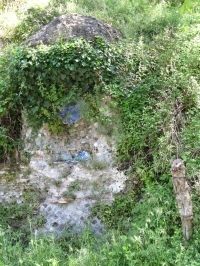 Nero's branch played a significant role in supplying water to residential neighbourhoods. 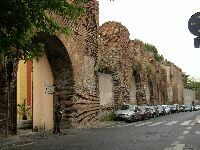 Because of their position and capacity, the 'Arcus Caelimontani' may have eliminated the need for introduction of additional aqueducts into the centre of Rome. 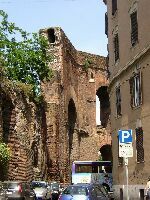 Despite the steady growth of the city in the late first century and the demands of the Flavian building program, no new aqueducts were added for over sixty years, until the Aqua Traiana was introduced to the Transtiber (Evans, 1983:399). Whether or not this was intentional, or merely good fortune, cannot be established for certain. Frontinus shows his concern to make most efficient use of water. He states that water should be reserved for human consumption and that water of poorer quality for irrigation or industrial purposes (1.91). 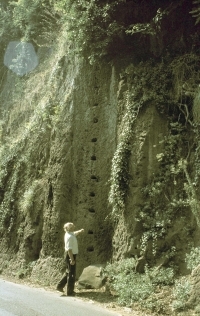 Specialized distribution through branches like the Arcus Caelimontani indicates a high degree of sophistication in the Roman water-system (Evans, 1983:399), which was not to be matched until the 19th century. 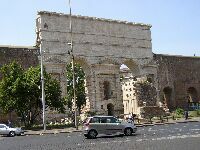 About twenty years after the original Neronian construction, Dominitian had an extension built from the original terminus at the Temple of Claudius to his new palace on the Palatine. Before this time, the Palatine relied on the Julia for its water. 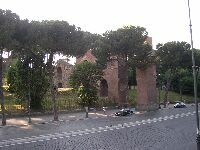 Septimius Severus extended the dimensions of the palace and restored the Palatine aqueduct, perhaps in conjunction with the restoration of the Arcus Neroiani (Aicher, 1995:68). 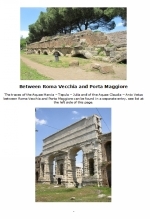 )1 See Figure D.2 for a photograph of a model of a section of the Aqua Claudia. 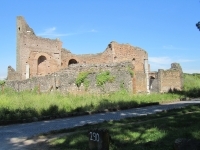 )3 While Nero deserves credit for his not-inconsiderable relief measures and reconstruction efforts, he did spend a small fortune on building his new 120 acre palace, the 'Domus Aurea'. It was perhaps for this reason that his relief efforts were not met with approval. )4 Referred to as the 'Arcus Caelimontani' in later inscriptions.